Australian Broadcasting Corporation, Every Cloud Productions. 2012. CD (ST)	ABC. 2799479. 2012. Australian Broadcasting Corporation, Every Cloud Production. 2012. Executive Producers: Fiona Eagger, Deb Cox, Carole Sklan, Christopher Gist. Producers: Fiona Eagger, Deb Cox. Composer: Greg J.Walker. Soundtrack album produced by Norman Parkhill. 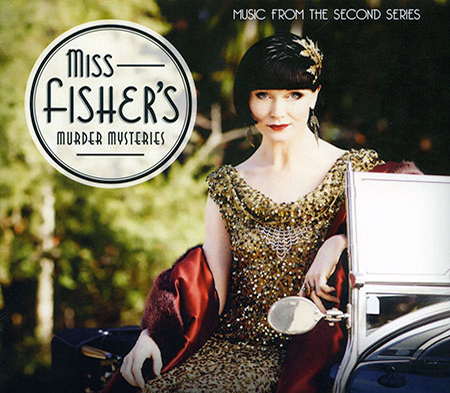 01: Miss Fisher’s Theme - Greg J Walker. 02: My Regular Girl - Ben Selvin & his Orchestra. 03: Dr Jazz - Jelly-Roll Morton & his Red Hot Peppers. 04: Positively Absolutely - The Six Jumping Jacks. 05: Mr Music Man - Harry Angus feat Deni Hines. 06: Hot & Anxious - Fletcher Henderson. 07: Creole Love Call - Duke Ellington & his Orchestra. 08: Makin’ Whoopee - Silvio Blonde and his Invisible Orchestra. 09: There’s A Wah Wah Girl In Agua Caliente - Isham Jones & his Orchestra. 10: Jungle Blues - Jelly-Roll Morton & his Red Hot Peppers. 11: If I Had You - Al Bowlly. 13: Dance Of The Blue Danube - The Anglo Persians. 14: Havin’ Lots Of Fun - Abe Lyman’s Orchestra. 15: Let’s Do It (Let’s Fall In Love) - Paul Whiteman & his Orchestra. 16: It Don’t Mean A Thing (If It Ain’t Got No Swing) - Duke Ellington & his Orchestra. 17: The Darktown Strutters’ Ball - Paul Whiteman & his Orchestra. 18: Sailing On A Sunbeam - Des Tooley feat Frank Coughlan. CD (ST)	ABC. 3762162. 2013. 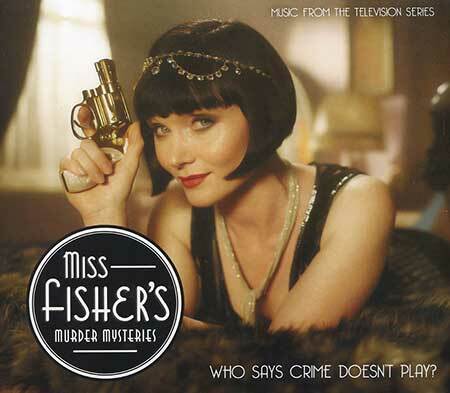 'MISS FISHER'S MURDER MYSTERIES MUSIC FROM THE SECOND SERIES'. 01: Fan Dance Medley. Greg J Walker. Dancing at the Imperial Club. (Episode 1). 02: Too Busy. Sam Lanin & His Orchestra. On the Beach. (Episode 3). 03: East St Louis Toodle-oo. Duke Ellington. Closing Credits. (Episode 2). 04: Lil’ Liza Jane. Kid Ory. Driving to Queenscliff. (Episode 3). 05: Spanish Mama. Doc Cook & His Dreamland Orchestra. Closing Credits. (Episode 1). 06: I Don’t Want Nobody But You. Park Lane Orchestra. Closing Credits. (Episode 4). 07: My Baby Just Cares for Me. Ted Weems & His Orchestra. Closing Credits. (Episode 6). 08: You’ve Got to Be Modernistic. Jimmy Johnson & His Orchestra. Closing Credits. (Episode 5). 09: Minnie the Moocher. Cab Calloway. Car Crash. (Episode 7). 10: Old Man Blues. Duke Ellington & His Orchestra. Ready for the Race. (Episode 7). 11: You Were Only Passing Time With Me. King Oliver & His Orchestra. Closing Credits. (Episode 8). 12: Bugle Call Rag. Cairo Club Orchestra. Car Race (Episode 7). 13: Up & at E’m. Ben Bernie & His Orchestra. Film Shoot / Closing Credits. (Episode 9). 14: Perdido Street Blues. New Orleans Wanderers. Phryne’s Soiree. (Episode 9). 15: Jazz Battle. Tuba Skinny. Phryne’s the Director. (Episode 9). 16: The Cider Song. Harry James Angus. Closing Credits. (Episode 10). 17: Flamboyance. Essie Davis & Greg J Walker. Radio Commercial. (Episode 11). 18: Let’s Misbehave. Harry James Angus. Hugh & Dot’s engagement Party. (Episode 11). 19: The World is Waiting For the Sunrise. Ted Lewis. Closing Credits. (Episode 12). CD (ST)	ABC. 4729012. 2015. 'MISS FISHER'S MURDER MYSTERIES SERIES THREE SOUNDTRACK ALBUM'. 01: Collins Street Jiggle. Greg J Walker. 02: Weary Blues. Louis Armstrong & His Hot Seven. 03: Struggle Buggy. King Oliver & His Orchestra. 04: Somebody Stole My Gal. Bennie Moten & His Kansans City Orchestra. 05: Crazy Rhythm. Roger Wolfe Kahn & His Orchestra. 06: When You’re Smiling. King Oliver & His Orchestra. 07: Nobody Knows You When You’re Down & Out. Bessie Smith. 08: Coquette. Bob Harding & His Orchestra. 09: You’re Always In My Arms. Arcadians Dance Orchestra. 10: There’s A Long Long Trail A Winding. Greg J Walker, Essie Davis, Philip Quast & Anthony Sharpe. 11: What’s The Use Of Living Without Love. King Oliver & His Orchestra. 12: I’m So Afraid Of You. Sam Lanin & His Orchestra. 13: Sunday. Abe Lyman & His Orchestra. 14: Rhythm Club Stomp. Cairo Club Orchestra. 15: Walkin’ The Dog. Hoagy Carmichael & His Collegians. 16: I Got Rhythm. Louis Armstrong & His Orchestra. 17: Farwell Blues. King Oliver & His Orchestra. 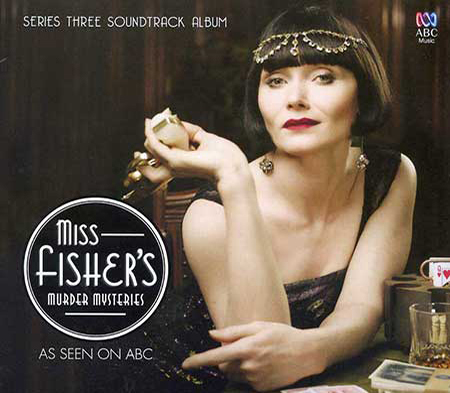 18: Miss Fisher’s Closing Theme. Greg J Walker.